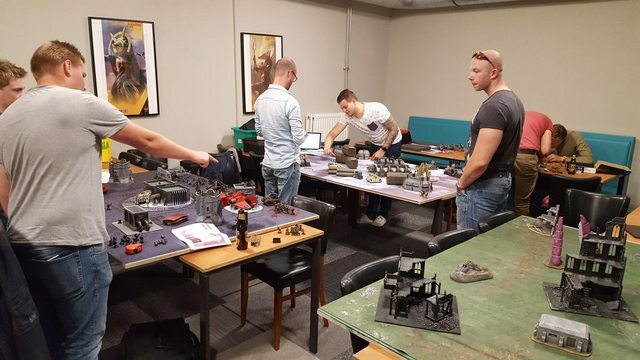 Gisteravond met een vriend samen onze eerste game 8th edition gespeeld en het was geweldig! Beide kostelijk vermaakt, en in mijn lunch pauze even een lekkere fluffy battle report geschreven met de foto's van gister. Enjoy! Moments after being send off-planet, the 93rd Regiment got its very first assignment. Strange Vox chatter emerged from the snowy industrial planet THX-III, the third planet in the Therox-system. 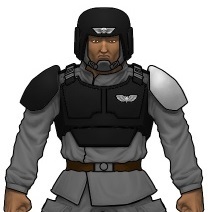 A small Spearhead Contingent, containing an Armoured Regiment, Artillery Regiment and Infantry Regiment was send down to the planet to investigate. We played a Matched Play game using a 1500 point limit, as well as all the Matched Play restrictions and some minor other limitations we will be using during on of our tournaments this month. We rolled for the mission which ended up being The Scouring. 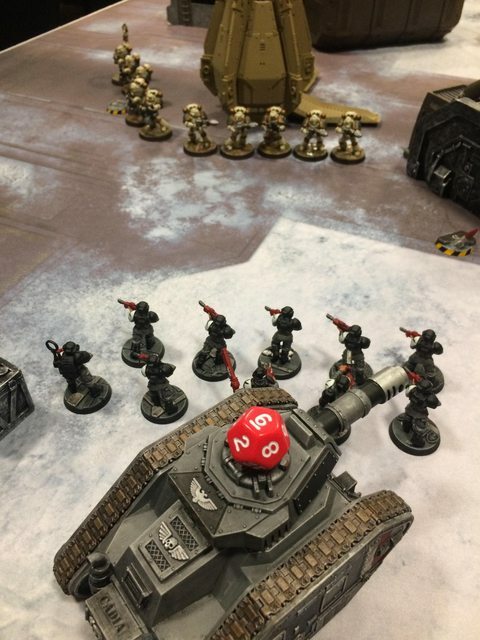 The Astra Militarum won the roll-off for placing objectives, thus letting the Space Marines choose the deployment types and zone. 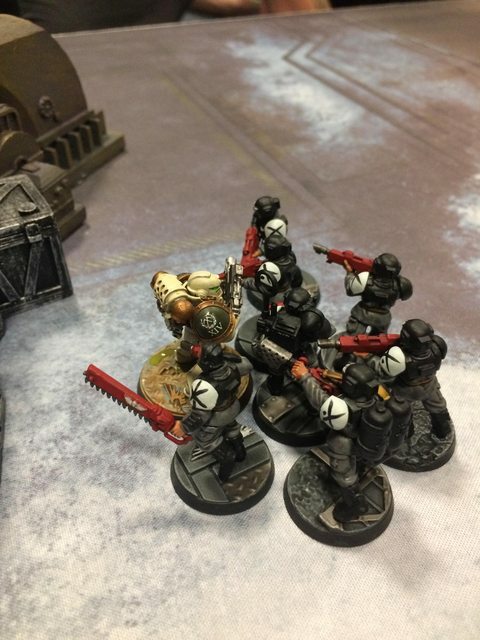 They went for a Front-line Assault set-up deploying the Drop Pod in Orbit with the Heavy Bolters Devestators and a Tactical Squad with Meltaguns embarked. The Astra Militaurm tried to seize the initiative from the Space Marines but failed by rolling a 2, and the imminent Drop Pod Assault followed. With a loud bang it dropped from orbit and crashed near the Artillery Batteries. Astartes emerged as the doors knocked upon and the air heated when they opened fire at the Battletank with their Meltaguns. They immediately penetrated the thick armour plating of the Leman Russ knocking off 6 wounds. The Devestators in the backfield locked the Manticore and fired their Missile Launchers, dealing an astounding 7 wounds and crippling the targeting systems of the tank. 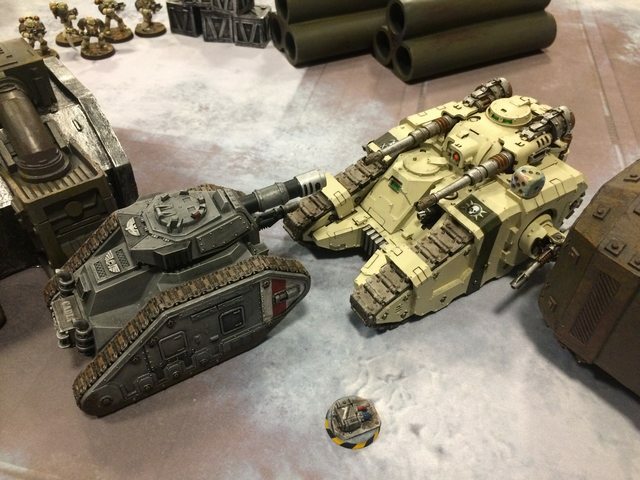 Without hesitation the Astra Militarum moved up, defying the enemy Astartes. 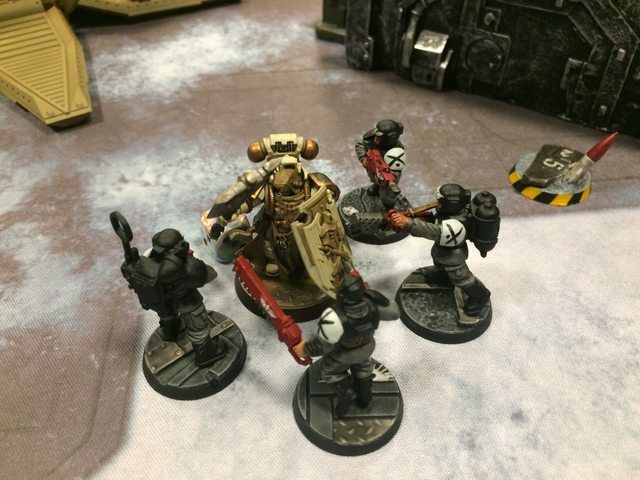 The Company Commander instructed the command squad to move up with their Meltaguns and the Knight Commander moved towards the immense Terminus Ultra. In a proud attempt he opened fire with his Punisher Gatling cannon, only scratching the hull of the Landraider doing only one wound. The Heavy Weapon team focused fire on the Drop Pod doing a couple of wounds and the Wyverns opened fire on the Astartes which disembarked from the Pod shredding some of their Power Armour. The Master of Ordnance instructed the Manticore to fire it’s deadly Storm Eargle Rockets on the Terminus Ultra but with the targeting system down from the previous round of shooting it failed to do damage. 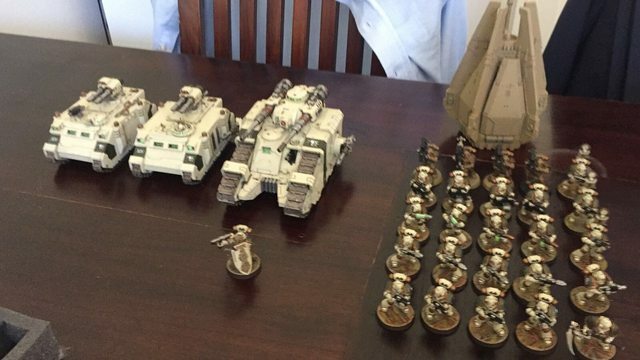 The Company Veterans with Plasmaguns disembarked from the Razor Back supercharging their weapons. One of the guns got to hot and blew up in the face of the Marine, while to other fired a bolt of Plasma towards the Knight Commander. The Razor Back itself shot it’s Twin Lascannon in the Russ doing some more damage, bringing it down to 5 wounds. 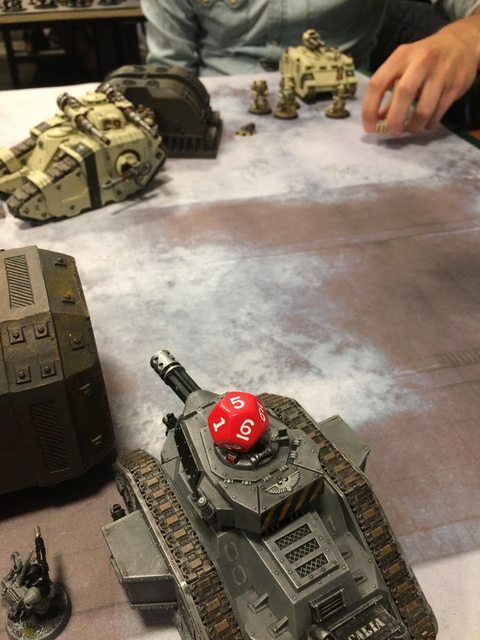 The Terminus Ultra retaliated from the sad attempt of shooting from the Punisher and aimed all it’s Godhammer Pattern Lascannons towards the Knight Commander, penetrating the Leman Russ with it’s super-heated laser beams doing 16 damage and wrecking the tank completely scoring First Blood and Slay the Warlord. The Tacticals with Meltaguns on the other side of the board fired a second salvo of super-heated air towards the Battletank crippling it to only 3 wounds left, blasting of a tank track in the process, charging towards the Infantry Squad. The Manticore fired a second Storm Eagle Rocket towards the Terminus Ultra, using the guidance of the Master of Ordnance to do 7 hits. The Landraider was engulfed in fire but the heavy plating of the tank protected it from most damage. The damaged Batteltank tried to drive towards the objective but could only move a small distance due to it’s blasted track, and tried shooting at the Drop Pod. With its ballistic skill down because of the damage the crew did not manage to make any hits. The sergeant of the Infantry Squad, still locked in combat with the last remaining Marine, lifted his Laspistol and executed him. The Astartes went all-in, moving up the front to do maximum damage. The Librarian moved towards the Infantry Squad which executed the Tactical Marine to retaliate and the Tactical Marines with Bolters disembarked from the Razor Back, moving towards the Battle Tank in the centre of the battlefield. The Missile Launchers, still in the backfield eying and objective, shot a third salvo and blew up the Manticore. Terminus Ultra shot a Wyvern down to 3 wounds incapacitating it. 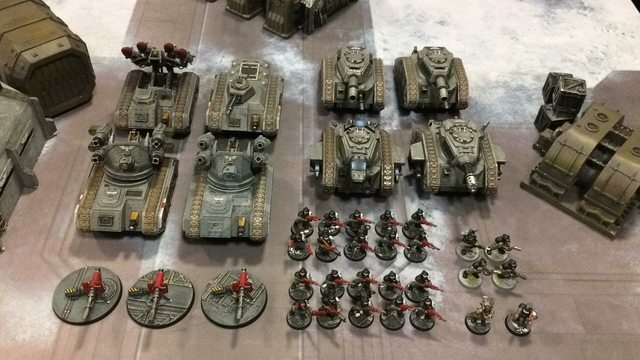 The Astra Militarum tried to salvage the battle and moved in new attack formations, having lost a substantial amount of firepower. The Infantry squad opened fire at the incoming Librarian doing a wound and the Wyvern also opened up fire danger-close at Librarian, doing another two wounds bringing the Psyker down to his last wound. The Battletank in the centre, still untouched by the Astartes, opened fire on Terminus Ultra and did a couple of wounds while it drove closer. The Executioner tried to fire a Plasma salvo into his rear but didn’t manage to do any damage. Having just minutes left before the area would be bombarded from orbit due to the severe losses of the Spearhead Detachment (Or was it our store closing down?) 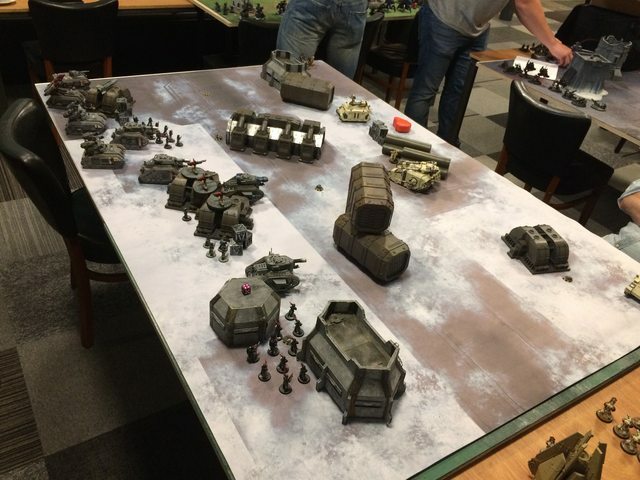 the Astartes and Astra Militarum made some final tactical moves. Terminus Ultra moved up to the centre, almost ramming the Battletank, opened fire and decimated it. The Razor Backs moved up to capture two objectives. 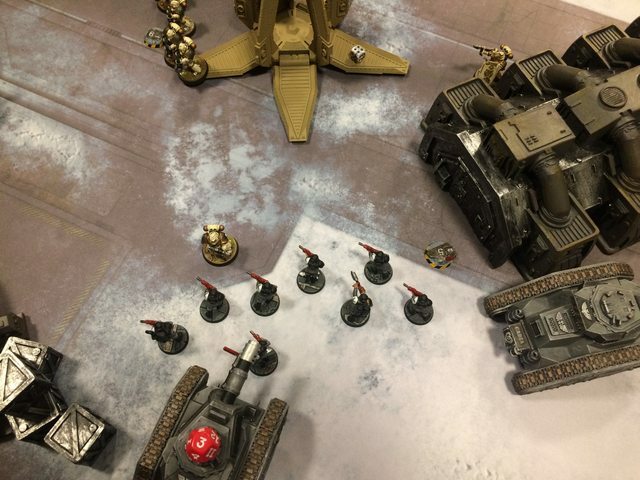 The Astra Militarum Command squad moved up and fired a Melta salvo in the Terminus Ultra, followed by three hits from the Heavy Weapon team with their Lascannons. Terminus Ultra finally blew up, a last minor victory for the Astra Militarum. Finally the command squad got wiped (above I'm removing them from the battlefield with a sad face) and one of the Wyverns got wrecked. The other Wyvern advanced to claim an objective. The game ended with the Space Marines claiming three objectives worth 9 points and the Astra Militarum claimed two objectives worth 6 points. Together with the extra points the Astartes claimed victory with 11 - 6 points. After a valiant battle the Spearhead Contingent was severely damaged, multiple tanks had been destroyed a many lives were taken. The Astartes won the skirmish and vanished without leaving a clue, keeping their intentions secret. Ookal is dit bericht al heel oud vind ik het alsnog vet om te lezen als newbie! Vet! Heb hem gelijk in een keer gelezen wel leuk dat je het puntverschil pas later zag! Haha. Altijd leuk om te lezen zsker voor mij als beginner,kan ik veel van leren! !